This isn’t necessarily a marketing-focused blog post, but I guess that’s based on how you interpret it. If you consider having to market yourself “marketing”, then I guess it still fits my blog! There are times I’ll write about something that I think can be extremely valuable for my readers, even if it’s not directly internet marketing related. This is definitely one of those times and topics. Read on, I have a feeling you won’t regret it. Email communications can be tough. You obviously can’t see body language or hear tone from the other person involved, which often leads to messages being misinterpreted. For example, is the person joking, serious, a mixture of both, etc? And, you can’t a have real-time exchange which can lead to resolving conflict before it escalates (like if someone could see that you were not happy with their last sentence, they might change the way they are communicating their message). In addition, since the person you are communicating with via email isn’t in front of you, you might feel the need to respond as quickly as possible, which might be rushed and not exactly worded the way you wanted it to (and I’m being nice here…) I think everyone has been in that situation, and it’s easy for an exchange of emails to get out of control. It’s human nature. So if you are nodding right now in agreement with me, then have I got the solution for you! I learned something about 3 years ago that was so simple, yet brilliant. I saw immediately how it could curb some of the knee-jerk reactions we all experience with email and I’d like to share this tip with you today. And yes, it could actually save your job one day (or save relationships with coworkers, clients, partners, etc.) I actually introduce this tip to anyone that works for me, which they probably end up using when responding to emails from me! ;-) And just to be clear, I’m not saying that I’m perfect at handling email communications…this tip just helps. I’ll get to the point and then quickly explain how to set this up. 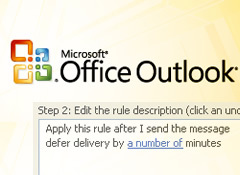 The simple, yet brilliant tip I picked up is to create a rule in Outlook that delays your email by 1 minute (or whatever timeframe you feel is right). This enables you to delay your potentially rushed, rash, rude, biting, retaliatory emails for a short period of time before being sent. That just might be enough time for you to think through what you just wrote and then refine it before it gets sent. I’ve found this rule to be an extremely valuable one to have in place. 1. 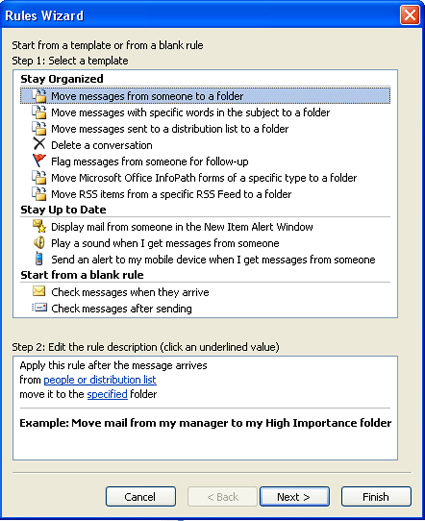 Open Outlook and click the Tools menu, and then select Rules and Alerts. 2. Click the Create New Rule button. 3. Then start with a blank rule (for me this option is at the bottom of the window). Choose “Check messages after sending”. See below. 4. Click next and don’t check any of the conditions listed (since you want every email to be delayed). 5. 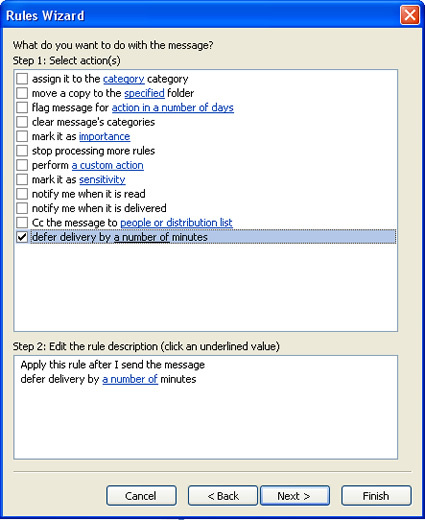 Click next and then click the checkbox for “defer delivery by a number of minutes” at the bottom of the conditions list. 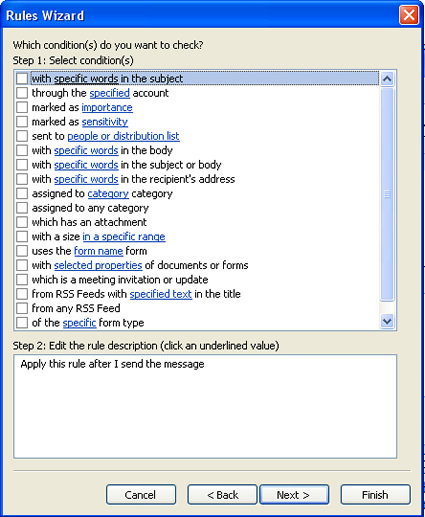 When you click the checkbox, the rule shows up in a window below the actions list where you can edit the rule. Click the text, “a number of” to enter the delay. I use 1 minute, but you can use any number of minutes you like. 6. Click next and don’t check any of the exceptions listed. 8. Then make sure “Turn on this rule” is checked. Then click Finish. That’s it, you should be good to go. Send a test email and make sure that you see the email sitting in your Outbox for a minute before finally being sent. At that point, you can always go in and edit the email if you decide to change what you originally wrote. Once you set this up, you will have a 1 minute safety net for your emails. I’m telling you, one day you will thank me for this simple rule. Think about it, if you’ve ever said anything that you regretted 5 minutes after saying it, then this is the rule for you. You get a chance to say it, delay it, and then refine or delete it. It’s brilliant. Go set this up now and let me know what you think. –Now if they can only create something that delays your speech by 1 minute!